Southern Style was great, but needed blankets. There was one blanket for each king bed. No extra blanket or comforter. No blankets for sofa bed or futon. This cabin had everything our family needed and more. We enjoyed the seclusion but yet it was a perfect distance to all the fun in Pigeon Forge. The staff at Cabins USA were courteous and friendly. They even gave us a follow up call the day after check in to make sure there were no issues with our cabin. We look forward to returning to this property in the future. We have been using Cabins USA for over 20 years and we have NEVER been disappointed! We absolutely LOVED this cabin, very nice and plenty of room for the 5 of us. Loved the parking enough for 2 or 3 cars the location was only 5 miles from parkway. One of the best cabins we have stayed in thus far !! Our stay at Southern Style was great. For a family of 5 this cabin was the perfect size. We really enjoyed the relaxing atmosphere and it was peaceful and quiet at night. It wasn't too far away from all of the attractions in Pigeon Forge, only a 15-20 minute drive depending on traffic. We will definitely be looking to stay here again when we return. The cabin was wonderful!! We were hoping for some color change but Cabins USA has nothing to do with that!! I would like to make some suggestions if you don't mind. There were 4 people staying here and we all had water problems! Please put longer shower curtains in baths! Also I noticed some (few) bugs. Maybe just the time of year? Mostly in the kitchen and bath. Those are my ideas and didn't make much difference to me. I have already recommended your cabins to friends and we are planning next years' trip to include other friends!! Thank you, Cabins USA for a great trip. I looked at several cabins and really liked this one when we showed up we were very surprised and it was so much more than expected we enjoyed ourselves and had everything we needed we will be back had no issues with anything! Southern Style was a very beautiful cabin with great amenities. It’s often hard to find a 2 bedroom with 2 king size beds...and the mattresses were very comfortable. The entire cabin was very clean and the extra towels and wash cloths was an added bonus. The living room actually has a leather sofa and 2 nice leather side chairs instead of what you see on the website photos which is much nicer. While there wasn’t a mountain view we enjoyed the seclusion and quietness. It’s only a 20 minute drive to pigeon forge and only 5 minutes to several nice restaurants. The only recommendation we have is to add brighter lightbulbs in the entire cabin as it was a little dark even with the lights on. We would definitely rent this cabin again in the future. The unit had a few issues with cleanliness. Stove , microwave and grill were pretty dirty. We saw a minimum of 10 roaches one was actually in the refrigerator. The unit was very pretty and furniture was not bad. An appointment with a pest control company and a through cleaning and it would be amazing. Our cabin was excellent! So much more space compared to a hotel. Our cabin had beautiful views of the mountains and we could only hear birds not traffic. I would definitely recommend doing the express check in. We did not and had to wait almost half an hour to check in. The hot tub was clean and we loved having a washer and dryer available. We will definitely book again with you! Nice cabin. Beware! It has been sold and they came to shut the water and electric off on the 2nd day we were there along with finding baby roaches in the kitchen while we were vacationing and had paid a full weeks rent. Whomever purchased this cabin should have made sure the electric and water was transferred to their name so the renters were not bothered with such a problem. We were given another cabin and $300 credit, but the only cabin left to rent was not as nice as this one, but it was clean and bug free! It was a hassle to pack all of our belongs and groceries and move to another cabin. We then had baby raccoons in the ceiling, but they couldn't get inside. Our compensation for all the trouble and messing up an entire day of vacation could have been more. Thank you cabin USA this cabin was prefect for our family beautiful location private easy access the cabin was warm and inviting my family loved it .we will be staying here again can't wait we loved it. Wonderful time in the smokies in this cabin. My husband and I enjoyed the privacy and location of this cabin. The only complaint was we had to add water to hot tub Everytime we used it. The Jets are broken and when water gets low they squirt out onto deck and house but we kept it full as we could. Other than that it was perfect and we would definitely stay again!! The cabin is beautiful. The location was far off from attractions and sites. The hot tub wouldn’t get hot at first because it was over filled, which we had to figure that out ourselves because maintenance said everything looked ok. Other than the hot tub issue and the location everything was perfect. I would/will definitely stay with cabinsUSA again In the future. Everything was great in the cabin except the loft is hot. No air and the fan did not allow for a lot of air. Cabin is beautiful and the furnishing are great also. We reported that there were beer cans left from the previous guests outside on porch and in the yard, a cigar portion was found on the porch, and a dead bird on the porch. Other than that it was great. If we rent again, we would like to be closer to Pigeon Forge. Great price and friendly staff. Only problem 20mins away from anything other than that i loved it. I am so happy to hear that you enjoyed your stay in Southern Style! We here at Cabins USA strive to give each of our guests the best stay possible while vacationing in the Smokies. When you are ready to stay with us again, please mention you are a return guest for an additional discount. Thank you again for your review and thank you for choosing Cabins USA! Great place to spend our anniversary!! The cabin was wonderful. Very clean and cozy. However their could be a few upgrades added such as new cd players, new grill, new outside dart board. Also the hot tub could have used some fresh water and the family games are a great idea but if you are going to have them then there should be for example pens so you could play clue. In closing my entire family enjoyed their stay and it was a wonderful experience and so much better than a hotel. We will be renting again. The cabin was beautiful, very clean. Only thing we had to do was change the AC filter. Was completely clogged up , but after changing filter ac worked great. Would definitely stay here again ! Thank you for taking the time to let us know about your recent stay in Southern Style. 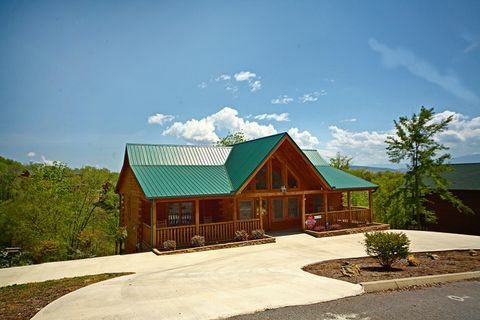 We here at Cabins USA strive to give each of our guests have the best stay possible while vacationing in the Smokies. I apologize for the issues you experienced with the air conditioning. Your comments have been forwarded to our maintenance department to be addressed. Thank you for choosing Cabins USA and we look forward to seeing you again soon! The only recommendation I have is for one night rentals. We paid almost $300 to stay there and was only allowed to check in at 4pm and then checkout at 11am. We have stayed with Cabins USA before but they are the only place I've stayed that doesn't call when the cabin is ready and let you check in. And the only place that doesn't allow early check in. I feel that I with a one night rental and the amount of money we pay for less than 24 hours we should at least be allowed an early check in. We rode around Pigeon Forge from 10am until 4pm because we weren't authorized to enter the location prior to 4pm. We did find our cabin though so we would know how to get there and it was ready at 1pm. Super frustrating and I hope over time this gets better. Thank you for taking the time to let us know about your recent stay in Southern Style! We here at Cabins USA strive to give each of our guests the best stay possible while vacationing in the Smokies. Our cleaners and maintenance department have until 4:00pm to ensure each cabin is completely ready for our guests to enjoy their stay. Thank you for your review and thank you for choosing Cabins USA! Enjoyed our stay at Southern Style. The booking and check-out process was very easy! The main negative and reason I wouldn't book this cabin again is becsuse of the shower size in both bathrooms. They are EXTREMELY small with no room to turn around. However, will continue to book with Cabins USA! This was our first time using Cabins USA, we will definitely be using them again. The cabin was beautiful, clean, peaceful. This cabin has been one of the best ones we have stayed in. We loved that is was away from everything but not to far away. You could be on the parkway in 20 minutes. The only down side for us was the bathroom was very small. We would more then likely stay here again. Positives: the bed in master was comfortable, the jacuzzi tub inside had plenty of hot water, in fact every time My wife used it, it was too hot and she had to add cold water, lol. This was a major plus since the last time we rented a cabin for a romantic getaway (not with Cabins USA) the tub would get cold with only a few inches of water in it! The hot tub outside was great, plenty of room and once we set it to our preferred temp it stayed at that. Enjoyed the dart board and outside screened in porch. There were sufficient plates, utensils, cups and cooking items, A blender, toaster and coffee maker, none of which we used, but nice to have if needed. Very nice cabin decorations! We liked having the alarm in the cabin, especially since we are unfamiliar with the location. Didn't have to worry about our stuff while sleeping or away. They had a very large nice stainless steel grill, but we did not use it. The location was great, no one across the road from us and only 1 cabin visible next to us, and the hot tub is placed on the more private side bordered by trees, so if felt much more secluded! The washer and dryer was an added bonus had we stayed longer we may have used it. Nice to have the option if needed. Needs a little improvement: first and foremost the garbage disposal has a very foul smell, we tried to run water and put soap in it but it seemed to only get stronger. the pool table is nice, however the area in which to play in made it difficult for us to shoot at times, the couch needs to come out and the pool table centered in the loft to be able to properly shoot from all sides, I get it allows for 1 more bed and person to sleep though. Also it gets very warm up there, I can't even imagine what it would feel like in the dead heat of summer, probably unbearable, especially since they warn you not to turn air lower than 70! The master shower is very small with poor water pressure, but still got the job done. It was nice how high up the shower heads were placed though, I'm 6'4" and usually they are never high enough. Overall we greatly enjoyed our stay at the cabin. Thank you Cabins USA! Overall, we very much enjoyed our stay at the cabin. I was a little surprised at all the extra fees at the time of booking. The cabin was very nice and very comfortable. Thank you. I am happy to hear that you enjoyed your stay in Southern Style! We here at Cabins USA work hard to make sure each of our guests have the best stay possible while vacationing in the Smokies. When you are ready to stay with us again, please mention you are a return guest for an extra discount. Thank you again for your review and thank you for choosing Cabins USA! The whole process concerning Cabins USA was first rate! After finally finding the cabin, everything was great! I'll come back to Cabins USA when vacationing in the mountain area again! Loved the cabin. We will definitely be staying with yall again. It was so beautiful. We had great family time and I feel it brought us closer. Thank you USA Cabins. Excellent accommodations, gives you the seclusion away from the hussle and bussle of busy pigeon forge and Gatlinburg(though they are a nice pleasant drive). We stayed in Southern Charm for 5 nights and loved everything about this cabin. The location was easy to find and the driveway was perfect for loading and unloading luggage. The cabin had exactly what we were looking for in a cabin: hardwood floors, leather furniture, two bathrooms, and a fireplace. We usually stay in a difference cabin each year when we visit the mountains, but we would stay in this cabin again. The cabin was clean and the bed was very comfortable. They had enough towels and supplies for the entire week. The young lady that checked us in was so sweet and very helpful. She treated us like friends and we enjoyed talking with her. The only thing we could not figure out was the extra fireplace in the bedroom. We would not find a way to turn on this fireplace and we did call and they were not able to help with that. The fireplace in the living area was working and very nice for the cooler nights. We enjoyed our stay and Cabin's USA were helpful and made our time in Pigeon Forge a wonderful vacation. Thank you for taking the time to let us know about your recent stay in Southern Style! We here at Cabins USA work hard to make sure each of our guests have the same great stay you enjoyed while vacationing in the Smokies. When you are ready to stay with us again, please mention you are a return guest for an additional discount. Thank you again for your review and thank you for choosing Cabins USA! Great place to stay! Nice place to relax and enjoy peace and quiet! Beautiful cabin with all the luxuries you could want on vacation. Had problems with the televisions but maintenance personnel came and took care of it. One suggestion is to make sure the alarm is disarmed before new people arrive. We arrived and put the key code in and within a minute the burglar alarm went off. My suggestion would be to better inform the new arrivals what to do if this happens. Overall I would give Cabins USA a TEN! We loved the cabin as we like to be closer to Sevierville and away from Pigeon Forge traffic. Cabin was perfect for two couples or in our case two couples and one child (she loved the loft). It's on our list to return! WE had an amzing time and our residents did also Thanks for everything. We had wonderful time. Cabin was everything as advertised. Would recommend to Cabins USA to anyone wanting to visit the Smoky's. Wow! What an amazing cabin in a perfect setting! From check-in to check-out everything was perfect. The cabin was beautifully furnished in a style appropriate for cabin living. Everything one would need had been provided making it unnecessary to leave the cabin. Hot tub, darts, pool table, multiple TV's, DVD players, fireplaces, grills, varied outdoor seating - fun and enjoyment for everyone. Loved the view from the back porches! We will be back to this cabin - often! The only issue we had while there were bees which is expected and the toilet in the master bathroom didnt flush very well. It was stopped up. We plunged it but it still didnt seem to work correctly. Other than that it was our first time staying with you and we loved it. The beds were VERY comfortable. Thank you for taking the time to let us know about your recent stay in Southern Style! We here at Cabins USA work hard to make sure each of our guests have the best stay possible while vacationing in the Smokies. Thank you for letting us know about the toilet in the master bathroom. Maintenance has been notified and will be correcting that issue. When you are ready to stay with us again, please mention you are a return guest for an additional discount. Thank you again for your review and thank you for choosing Cabins USA! An absolutely wonderful weekend getaway with my girlfriend. My wife will never know! Got to the property at 5:15 pm. Cleaning people were still there so we rode around for a while until they finished. Hot tub water was cold so it was about 10pm before it reached a hot temp. Other than those 2 things everything was great. Got a message after I got home that I needed to sign some papers but was already back in Knoxville. Sorry I would have come back by the office but I didn't realize I needed to. Thank you for taking the time to let us know about your recent stay in Southern Style. I apologize that you weren't able to utilize the hot tub until later your first night. Our hot tubs are dumped and cleaned between each reservation, so it can take a few hours for them to heat up to the proper temperature. When you are ready to stay with us again, please mention you are a return guest for an additional discount. Thank you again for your review and thank you for choosing Cabins USA! THE Hot tub was not working at all why we were there.We were there 5 nights.They said they would give me 25% off for next year on a cabin.I book it for Aug.5th for 5 nights and it is highter then what I could have rented it for on the internet.Not happy at all. We were moved to this cabin when the cabin we booked had septic problems. We had originally booked in Pigeon Forge, but were moved to this cabin in Seveirville. It seemed like a long ways away, but we were very happy with the location in the end. It is tucked away, but close to other cabins. We never heard any noise from other cabins. When we arrived the hot tub wasn't working. After flipping the breaker it would die time and time again. Maintenance was out in about an hour and Brian H. was the maintenance man that stayed very late and fixed the problem. The heating element wasn't working so he fixed it while we were able to go and have dinner. By the morning the hot tub was plenty warm. The cabin was clean and had plenty of towels. The tv's were nice and modern. The darts were not very good so I would bring my own if you want to play. They didn't have tips on them to make them stick in the board. We had a very nice time at this cabin and would recommend it to anyone. Thanks for a great experience again, Cabins USA! Thank you for all of your kind words! We here at Cabins USA work hard to make sure that each of our guests have the same great stay you enjoyed while vacationing in the Smokies. Thank you for letting us know about the darts in the cabin. Maintenance has been notified and will be correcting that issue. Thank you again for your review and we look forward to having you as our guest again! Had a wonderful time at Southern Style. I am so happy to hear that you enjoyed staying in Southern Style! When you are ready to stay with us again, please mention you are a return guest for an additional discount. Thank you for choosing Cabins USA and we look forward to having you as our guest again! Southern Style was just right. Not too far out of the way from things, but far enough that you don't hear traffic noise, just crickets. Would stay here again! I am so happy to hear that you enjoyed your stay in Southern Style! We here at Cabins USA work hard to make sure that each of our guests have the same great experience you enjoyed while vacationing in the Smokies. When you are ready to stay with us again, please let our reservationists know you are a return guest for an additional discount. Thank you again for your review and we look forward to having you as our guest again! The cabin was very clean and nicely furnished for our vacation. It is a little out of the way from restaurants and attractions although if you know this before you go, its not a big deal. The pool table was missing the 9 ball and there were no darts for the outside board but other than that, everything was great. Thank you for taking the time to let us know about your recent stay in Southern Style! Our housekeepers work hard to make sure that each cabin is thoroughly cleaned and fully stocked so all our guests have to do is walk into their cabin and start relaxing. Thank you for letting us know about the missing pool ball and lack of darts. Maintenance will be notified so that issue can be resolved. Thank you again for your review and thank you for choosing Cabins USA! Cabin was very clean at check in. There is insufficient sitting options in living room. Only a sofa and an uncomfortable rocking chair. The cabin was well layed out but bathrooms are small and lighting level was insufficient in them. Nice decks and quiet neighborhood. We really loved the cabin, little surprised how far from main attractions, but loved the country side views, the loft area was small, impossible to play pool, with out hitting walls. Only one couch in main living room, so no more than three people able to sit and watch tv together. Very clean , well decorated. This is a great cabin, my family and I had a great time staying there. We loved it a lot, there was only two issues we had while we were there, we could not get the fire place to work at all,, we don't know what we were doing wrong. Also we wish if the grill was enclosed its not convenient when its raining like what happened while we were there. Please get an indoor grill. We had to use an umbrella each time we had to check our grilled food that's being cooked. Overall everything was wonderful. Nice cabin very clean and up to date. We had to switch cabins due to the fact that the drive way was very STEEP and we were pulling a trailer behind our truck and couldn't make it up the drive. We went back to the Cabins USA office and Jamie was very helpful in helping us get a different cabin with same number of bedrooms with a drive way that was easy for us to get up. Southern Style was a very nice cabin, plenty of room for the 4 of us. Would definitely stay here again!!! Thanks again, Jamie for helping us!!!! Southern Style was a great escape from South Carolina! Me and my mom truly enjoyed our stay. Other than the yard maintenance everything was exactly as pictured online. Thank you for your review. We are delighted that you had a great time with us at Southern Style. We appreciate your feedback, and we will look into any concerns regarding the landscape of the cabin. We hope that we hear from you again soon for your next getaway to the Smokies. This cabin is gorgeous! It was very clean, in a secluded area yet easy to find (about 20 minutes from the Pigeon Forge strip), and the price was just right! The only kind of complaints I have are the showers are tiny and there were no darts for the dart board. I'm sure my family and I will stay here again! Thank you for you review. We are delighted that you enjoyed you stay with us at Southern Style. We apologize for any inconvenience you experienced during you stay. We will have maintenance make sure the cabin has darts. We look forward to hearing from you again. Stayed here for a ladies retreat and we loved the cabin! Its not in the mountains like we had thought it was but no complaints. We would definitely stay here again. Thank you for taking the time to write your review. We appreciate your feedback. We are delighted that you loved Southern Style. We apologize that you didn't have a cabin in the mountains. We do have many cabins that are further in the Smoky Mountains. For your next trip to the Smokies give our reservations staff a call and allow us to help you find a cabin that is in the perfect location for you. We hope that we hear from you soon! A PROBLEM BEFORE WITH ANOTHER GUEST , IT SHOULD HAVE BEEN CORRECTED BEFORE. MY ONLY OTHER CONCERN WAS A LACK OF HEAD ROOM IN THE LOFT AREA AROUND THE POOL TABLE. IT WAS NOT MEANT FOR SOMEONE 6'3 . OTHER THAN THAT WE REALLY ENJOYED STAYING AT THIS CABIN. Thank you for your review Steven. We apologize that the issue was not addressed before your stay. We do always ask our guests to report any issue while staying with us so that we can make sure it is fixed in a timely manner. We are glad that you enjoyed your stay with us at Southern Style. We hope that we will hear from you again soon. Please feel free to give us a call to help book your next stay and we will insure you will have plenty of room to play pool. This cabin is so far my favorite. We very much enjoyed ourselves. There were only a few minor issues that we reported and hope are fixed for the next time we visit. The main issue was the shower heads. Thank you for choosing Cabins USA. We are delighted you enjoyed your stay at Southern Style. We apologize for any inconveniences, and we are working on the issues addressed. We hope to hear from you again soon. This is the second time in a year that we've stayed in this cabin and we love it! Clean, plenty of amenities and lots of fun! My one and only complaint...the living room sofa. People...for as much as you charge for the cabin, I expect more seating and a little comfort in a couch. This year we came with another couple and ended up making a floor fort because the couch is slightly bigger than a love seat and legitimately feels like you're sitting on wooden boards. If you're going to keep it, invest in a couple of comfy chairs. Other than the couch which normally we wouldn't use but did trying to all watch a movie together, the house is amazing and just as wonderful as I remember. Thank you for taking the time to write your review Katie. We appreciate your feedback on your stays with us. All of our cabins are privately owned and Cabins USA is the management company for the cabins. Many of the amenities and furniture provided in the cabin is per each individual owner. Again, we are very thankful for your feedback and we do take everything said into consideration and make changes where we can. We look forward to seeing you again soon. We thoroughly enjoyed our stay with you all. The cabin was precious. The only thing we didn't particularly like was that there wasn't a grill out back on the deck off the kitchen. The cabin was very comfortable & pleasant. And we would & have recommended it to a lot of friends. Thank you all. The staff were outstanding! Thank you for taking the time to write your review Jayne. We are delighted that you enjoyed your stay with us at Southern Style. This cabin is a beautiful and luxurious cabin. The cabin does not provide the gas grill on the back deck, but it does provide a park grill out front. We greatly appreciate your business and we look forward to seeing you again soon. Just had problems with the lady bugs. Also you all could get a better couch for the living room. It was small and not that comfortable. But everything else was nice and clean. We will be back next year to try out a bigger cabin. The pool table on the second floor was great but didn't have much room to play pool. Thanks. Enjoyed our stay very much and we recommend the Rainforest Zoo to anyone. The house is wonderful! Views of the mountain, and it is very relaxing. The microwave stopped working on the last day. One of the rooms did not heat very well, it was cold. The person that fixes the fireplaces, arrived around 9:30pm. Even with those cons, i would def recommend this cabin! The cabin was very nice and we loved the hot tub! The only complaint we had was that there was no gas grill. There was a charcoal grill located out by the road on the other side of the driveway that worked ok. Other than that the only issues we had were minor. I would suggest bringing your own steak knives, hair dryer and something to light the grill. The water pressure in the shower (both) was terrible and the lighting wasn't very good. However, the kitchen was wonderful and had everything we needed for cooking and the dishwasher was very quiet (I had to open it just to make certain it started, LOL). We enjoyed our stay but will stay closer to Gatlinburg on our next visit because that's where all the things we wanted to do seemed to be located and the drive there was at least 20-30 minutes, depending on the time of day and traffic. The mountain view wasn't what we expected and we were a little disappointed by that. Overall, our stay was wonderful and we will certainly return to Tennessee... next time maybe the government won't have the Smoky Mountain National Park shut down!!! We enjoyed our stay at the Southern Style cabin. Thank you! Had a lovely time and enjoyed all the comforts. A few more pots and pans would have been good as we like to cook a big breakfast. We had a great time and the cabin was so nice !!!!! The cabin is beautiful, pictures online don't lie! Love it, love it!!! The cabin was very BEAUTIFUL , our family enjoyed the stay . All that was needed was a POOL for the kids but other than that would love to come back again and stay with CABINS USA !! I would like to start off by saying that this was the best experience we have had in renting. we were very pleased with the presentation and the cleanliness. The comfort and all of the amenities. The only thing we could have wished for better would be that the hot tub would have had more Jets. There were only 9 so we would have liked more and then the BBQ. the burners are bad, the lid is very loose and it was hard to light. but these are all things that we could live with. You might want to get a new BBq for the next people. We loved it so much that we are planning on going back at the end of Aug. for another 5 nights. The only sad thing is we will be looking for a different cabin that is closer to Gatlinburg. The reason for this is because we love to hike and it was a long 20 to 25 min drive every day. but if i was to go back and do no hikes i would definitely stay at the southern style again. I hope you can send me some specials for the end of Aug. We were fortunate to have gotten in on the pay for 3 nights get 2 for free. i was also wondering if we had to pay the administrative fees again and the house cleaning fee. I would gladly leave it the same way it was when we moved in, as i did with the southern styles. Thank you so much for such a great experience. I have told all my friends and people i work with about your cabins, i have shown them all the pictures and couldn't have expressed how much we loved it more. We arrived on Rod Run Saturday which made it practically impossible to get to the office for check-in (no fault of Cabins USA, of course!). We have used your company for several years and have always found it to be very efficient. One downside on this trip: We checked out prior to the office being open. When we called to say we were checking out, although the phone message promised the opportunity to leave a message, there was never an opportunity. We were forced to call a little later while on the road. This cabin was VERY nice - it was just a bit dusty, but we realize this is difficult to manage. The bathrooms and kitchen were very clean. Also, although the online description states it is minutes from Pigeon Forge, it is about eight miles or so from Wal-Mart in Pigeon Forge, and we found it took a while to get wherever we wanted to go. It is a very nice cabin, and we would not hesitate to recommend it to others. Thanks for allowing this opportunity for input. I really appreciated your staff helping me out with a flower arrangement for my wife. I am going to be very thorough on my review because I based getting this cabin for a week from reading the reviews. Here's the GOOD: Basically what you see in the pictures..Cabin was very nice, had a decent view, master bedroom with 2 person jacuzzi, DVD players all throughout and flat screen TVs. Hot tub was very relaxing, and the gas grille was very nice to have and use. Parking is very nice, no steep hills. The beds were also very comfortable. Here's where they have room for IMPROVEMENT: We got our keys right at 3 and headed to the cabin, when we arrived it was not clean yet, kind of a bummer, but I called and they had someone there in no time. Since this happened we got to watch it get cleaned, and had the comfort of knowing that everything was done right and we had everything we were supposed to, like towels, soap, etc.... The pool table upstairs is very cheap, it works and is fun, but it has problems staying level, and if you hit the ball to one side, it starts to roll back.... We also had trouble with the fire places. It ended up being low on propane, and they arrived in a timely manner to fix it, but soon after it went back to not working again. Not a huge issue for us, but would have been nice those cold mornings. Other than that a very nice cabin, and I will consider returning back to it in the future and using Cabins USA! Southern Style was AMAZING. This was exactly the vacation my boyfriend and I have been needing. We loved that the cabin is still in the neighborhood of cabins, but is much more spaced apart from the others giving us some seclusion. We had a nice mountain view, and the hot tub was absolutely glorious. Even though we had some small issues while booking, Cabins USA went out of their way to make sure we had a wonderful experience. I would definitely recommend this cabin to anyone looking for a truly relaxing experience. We have booked with Cabins USA multiple times. This was by far the worst experience we have ever had! Upon arrival, the jacuzzi tub in the master bedroom was leaking. We called the office and they promised to send someone right away. We waited a couple of hours and no one came. We called back and finally the maintenance person called. It took them four hours and they still didn't fix it, just left a note saying they were coming back the next day to repair. We were looking forward to a few days to relax as we were celebrating an anniversary. We discovered after hours that the living room fireplace didn't work right either. We called the office the next morning and they were supposed to pass that information along to the maintenance crew also. We left the next morning for a few hours and returned to find a note from the maintenance guy saying there was nothing wrong with the toilets! The toilets were fine, it was the tub that was leaking. As for the fireplace, he put a note on the fireplace in the bedroom and drew a diagram as to how to turn it on! There was nothing wrong with the bedroom fireplace, it was the living room. When we called to check-out our last day, we told the clerk how unhappy we were. She simply said she didn't think any of her maintenance guys would do that. This was the first time we have had any problems with them. We have stayed multiple times, but are not sure if we will return. We rented this cabin based on it's amenities and were not even able to use them. In this case, I'm not so sure they put the customer first. Thank you for your recent stay with us in Southern Style. I do apologize for all of the issues that you had during your stay. That is not how a stay with Cabins USA usually goes. These issues have been handed to our management team to ensure they are properly taken care of. A member of management will be contacting you soon. We hope that you will give us another chance on a future stay. Again, thank you for choosing Cabins USA. The Shower had no water pressure - just a light mist came out of the shower head. we have stayed every year and this was the best cabin I have had so far. We truely enjoyed our stay and the staff was helpful and polite when we checked in...thank you and we will be back next labor day for our annual stay. A very enjoyable place to stay & with a great view! It was a great cabin and well worth the price. Everything was working and the cabin was very clean. The radio on the back porch doesn't play CD's, but everything was very good. There was a tear in the netting out back when I got there, and they tried to charge me for it but after I talked to them they didnt. I would highly recommend this cabin to anyone! Only problem was that the remotes on two of the tvs would not work. But we weren't there for tv so it wasn't worth worrying about it. Everything else was quite comfortable and gave us a needed few days to rest. we really enjoyed our stay we hope to return soon !!! We had a very pleasant stay. Booking process online was very easy and the cabin was amazing. Great vacation, great town, will be back. Thank you for choosing Cabins USA. We are very happy we were able to provide you with a pleasant stay at Southern Style. We look forward to seeing you again soon on your next visit to the Great Smoky Mountains.